Great words to live by! As individuals traveling the road of life, it is a difficult journey. Some live up to these words, but for most, life centers on our daily routine, moving from task to task without giving this path a second thought. For some, this is a way of life. Blessed with so many abilities and attributes that made him an excellent pediatric dentist, Wayne cared about children. He cared about other pediatric dentists and their ability to care for all children. He cared about his staff, his friends and his family. Wayne was a champion of causes. For CSPD he was active on so many committees and a Board leader. He led by example. His creativity, in addition to his competence, led him to wonderful solutions. Who could forget the Annual Meeting he orchestrated with a cruise to Mexico or the recording of Murray the Moose’s greeting as a family entered his National Park-themed office. Wayne believed strongly that all children, regardless of their background, their finances or other complicating factors, should have access to the finest care possible, ideally by a quality pediatric dentist. He never ceased to fight for that and never let us lose sight of that goal. His message to the young and newer pediatric dentists was to become active within the CSPD, to share their thoughts, ideas, passions and opinions. Just participate, he would say, at any level possible, so we, as pediatric dentists may continue to do what’s essential to keep our specialty strong. 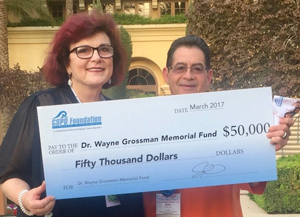 I am so pleased to announce that the Grossman family has generously made a donation of $50,000 to create The Wayne Grossman Memorial Fund at the CSPD Foundation. - This fund will be specifically set aside for the direct treatment of children who do not qualify for any state or federal programs, while at the same time fulfilling the Foundation’s mission of enhancing the educational experience for our residents in training. “I am making this donation of $50,000 to honor my life partner, Wayne Grossman and his pediatric colleagues of the CSPD. As many of you know, his death last year was very unexpected and quick. But, true to form in 23 days he was decisive, loyal and true to his values and heritage. His colleagues and friends, acted selflessly and compassionately. You came to support him and say goodbye and many visited his grave. We were childless for the first 20 years of our marriage. In this time he solidified his commitment and dedication to his chosen profession and work. After we adopted our son Alan, his understanding of children grew and broadened in even more responsible and creative ways. Whoa, what a bar mitzvah! Wayne would have wanted this money to be used for the care of children, as he would have done if he had lived. - Zoe and Alan Grossman. Wayne was a true friend to pediatric dentistry – and I’m proud to say, my friend in every sense of the word. As you travel the road of life, take a moment to reflect - Passion – Dedication – Generosity – Leadership… worthy traits to live by.